Golden trout (Kern River rainbow trout), photographed on the North Fork of the Kern River in the Funston Meadow section of the Kern Canyon, 08/19/09. Photo by Michael Carl. California golden trout , photographed on Golden Trout Creek near Big Whitney Meadow, 09/26/09. Photo by Michael Carl. Golden trout caught in Guitar Lake, 7/16/05. Length: 21 cm. Photo courtesy of Howard Kern. Golden trout, juvenile. Photo taken by Gerard Carmona Catot. PLEASE NOTE: The photos and information shown here are for Golden Trout. California has three distinct subspecies of Rainbow Trout commonly grouped as Golden Trout: Kern River Rainbow Trout, Little Kern Golden Trout, and California Golden Trout. California's official state fish is the California Golden Trout. 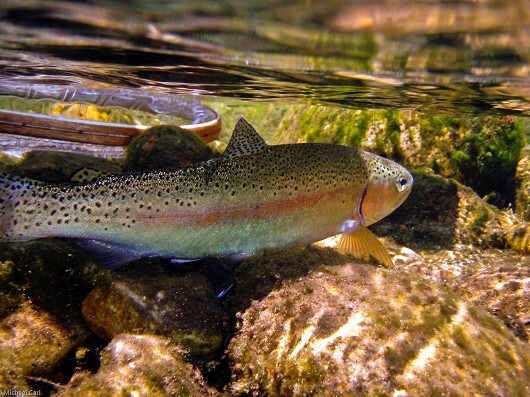 California has three distinct subspecies of Rainbow Trout commonly grouped as Golden Trout: Kern River Rainbow Trout, Little Kern Golden Trout, and California Golden Trout. 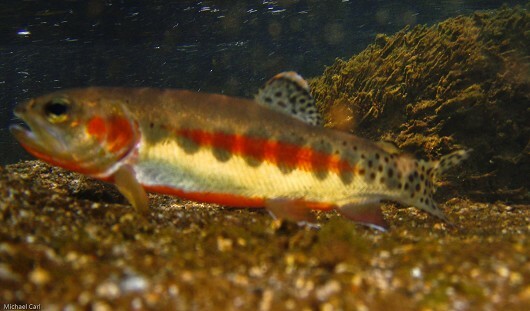 Today Kern River Rainbows are found in the Kern River between Durrwood Creek and Junction Meadow, though other transplanted populations exist. Little Kern Golden Trout are still found in their native habitat in the Little Kern River. California Golden Trout are found in their natal streams of Golden Trout Creek and the South Fork Kern River and in addition have been transplanted to many other isolated lakes and locations for the purpose of sportfishing. Generally these new waters are at high elevations and may include stretches of stream above impassible fish barriers. Many of these transplanted Golden Trout hybridize with hatchery reared coastal Rainbows. Native habitat for Golden Trout is primarily found at high elevations in meandering streams with little riparian vegetation. The water is generally clear and cold (3-22°C) and substrates are composed of cobble, gravel, and sand. Favorable reaches include pools that provide cover in the forms of undercut banks and aquatic vegetation. Individual Golden Trout tend to remain in a small stretch of stream measuring 16-18 m. Golden Trout feed both day and night on a wide variety of items, especially aquatic insects. Cryptic coloration or a lack of predators may account for their feeding habits. Despite increased vulnerability to birds and mammals, males develop especially bright colors during the breeding season. Golden Trout may live up to 9 years, reaching 10-11 cm SL by the end of their third summer. Their growth rate slows to 1-2 cm/year thereafter and they may eventually reach 19-20 cm SL. Lake dwelling Golden Trout arriving via transplants grow more rapidly and reach greater maximum sizes. Golden Trout reach sexual maturity in 3-4 years and spawn in late spring or early summer when water temperatures range from 10-15°C. Spawning peaks in the afternoon when water temperatures reach their daily maximum. Females dig wide shallow redds among small gravel particles and lay 300-2,300 eggs. The eggs hatch in approximately 20 days at 14°C. Emergent fry remain in the substrate for 2-3 weeks before rising into the main water column. Please see the Rainbow Trout page for more general information about Rainbow Trout. Golden Trout poster (jpg). Provided courtesy of CalTrout, with permission from US Forest Service and Joseph Tomelleri. 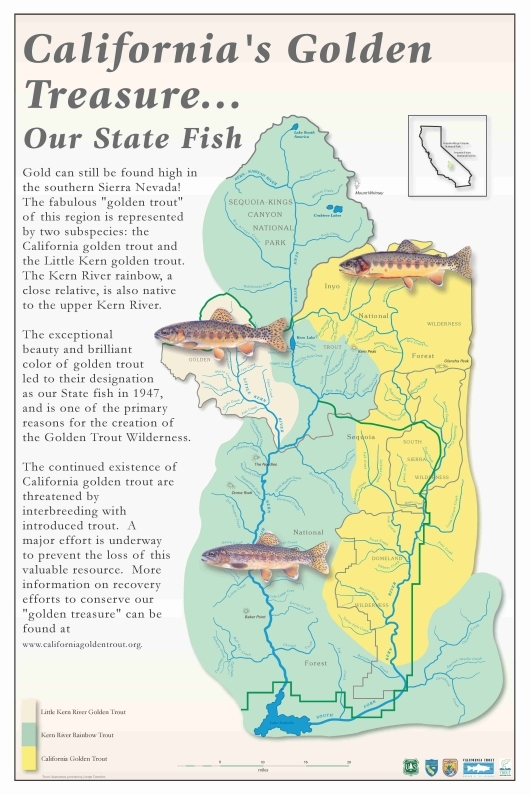 This Golden Trout poster with illustrations by Joseph Tomelleri and a habitat map was provided courtesy of CalTrout, with permission from the US Forest Service (Sequoia National Forest) and Joseph Tomelleri. Collaborators also included the California Department of Fish and Game, US Fish and Wildlife Service, and Trout Unlimited. The poster is available in high resolution pdf format as a free download by clicking the link below. Please note, the pdf file is about 10 MB. Golden Trout poster (high resolution pdf file).